In today’s constantly changing workplace, it’s important to keep up with strategies for successful communication, whether it happens through email, websites, presentations, social media, or cover letters. 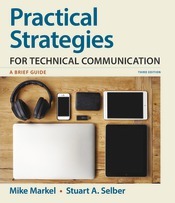 Practical Strategies for Technical Communication helps get students up to speed with a concise, accessible guide to everything they need to know about audience and purpose, document design, research, style, and more. In the third edition, noted scholar and teacher Stuart A. Selber joins the author team. The new edition features expanded coverage of nontraditional resume formats such as infographics and videos, a new discussion of usability testing, and an array of revised and updated Tech Tips. Practical Strategies for Technical Communication is available with LaunchPad– a customizable course space featuring an ebook and an exciting array of digital resources including a test bank, adaptive quizzing, multimedia Document Analysis Activities, and more. To order or purchase the print book packaged with LaunchPad, use ISBN 978-1-319-22438-7.